Seoul (AFP) – The leaders of North and South Korea will hold a historic summit in the Demilitarized Zone next month after Pyongyang expressed willingness to give up its nuclear weapons in exchange for security guarantees, Seoul said Tuesday. The North is open to “frank” talks with the United States on denuclearisation and would suspend missile and nuclear tests while dialogue was under way, the South’s national security adviser Chung Eui-yong said after returning from a meeting in Pyongyang with leader Kim Jong Un. North Korea is subject to multiple rounds of UN Security Council sanctions over its atomic and ballistic missile programmes, and has long insisted that its “treasured sword” is not up for negotiation. But it is willing to abandon the programmes if its national security — and that of its leadership — is guaranteed, Chung said. That remains a high threshold — Pyongyang has considered itself at risk of invasion by the United States since the Korean War ended in a ceasefire in 1953, leaving the two sides technically still at war. But, Chung said, Kim is willing to discuss denuclearisation in talks with Washington — which could be the crucial concession needed to enable a dialogue to happen. The US has long insisted that Pyongyang take concrete steps towards denuclearisation as a precondition. Tuesday’s developments are the latest steps in a rapid Olympics-driven rapprochement on the peninsula. They follow a year of high tensions during which Pyongyang carried out its most powerful nuclear test to date, along with multiple missile launches, including rockets capable of reaching the US mainland. Kim and US President Donald Trump traded personal insults and threats of war, sending fears of conflict spiralling. But the Pyeongchang Winter Olympics in the South triggered an apparent transformation, with Kim sending his sister to the opening ceremony and sparking a flurry of cross-border trips as South Korean President Moon Jae-in tries to broker talks between Pyongyang and Washington. Kim said he would “understand” if the South goes ahead with delayed joint military exercises with the US that usually infuriate Pyongyang, a senior official at the South’s presidential office added. The envoys’ visit had produced “a very important breakthrough”, said Cheong Seong Chang of Sejong Institute think tank, calling the results “an important first step towards stably managing the North’s nuclear and missile threats, preventing war on the Korean peninsula and building political and military trust”. He cautioned that the definition of “military threats” the North wanted to see removed was “up for interpretation”, but said he believed Washington and Pyongyang “would soon begin serious dialogue”. But previous negotiations have ultimately foundered. Six-party talks, grouping the two Koreas, Russia, China, Japan and the US, and offering the North security and economic benefits in exchange for denuclearisation, broke down almost a decade ago. North Korean state media pictures of the delegation’s meeting with Kim in Pyongyang — which Seoul said lasted more than four hours — showed the North’s leader in jovial mood, smiling and shaking hands enthusiastically. “Hearing the intention of President Moon Jae-In for a summit from the special envoy of the south side, he exchanged views and made a satisfactory agreement,” the North’s official news agency KCNA said earlier. Rodong Sinmun newspaper, the mouthpiece of the ruling Workers Party, devoted its entire front page Tuesday to the visit. 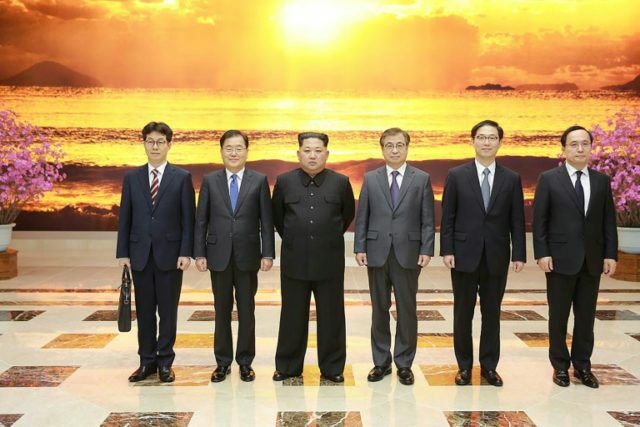 The Seoul representatives’ trip came after the North’s leader sent his sister to the Winter Games in the South and invited Moon to a summit in Pyongyang. Kim Yo Jong’s trip was the first to the South by a member of the North’s ruling dynasty since the end of the 1950-53 Korean War. Her appearance at the Games’ opening ceremony — where athletes from the two Koreas marched together — made global headlines. At the time Moon did not accept the invitation to a summit, saying that the “right conditions” were needed. It could be a challenging task — Trump has dubbed Kim “Little Rocket Man” and boasted about the size of his nuclear button, while the North Korean leader called the American president a “mentally deranged US dotard”.